Examines the relationships between nonprofit organizations and donors. Outlines important steps needed in order to develop successful giving–receiving or gift relationships. Provides a framework for donors to determine comfort levels of giving and illustrates how tax changes influence giving. 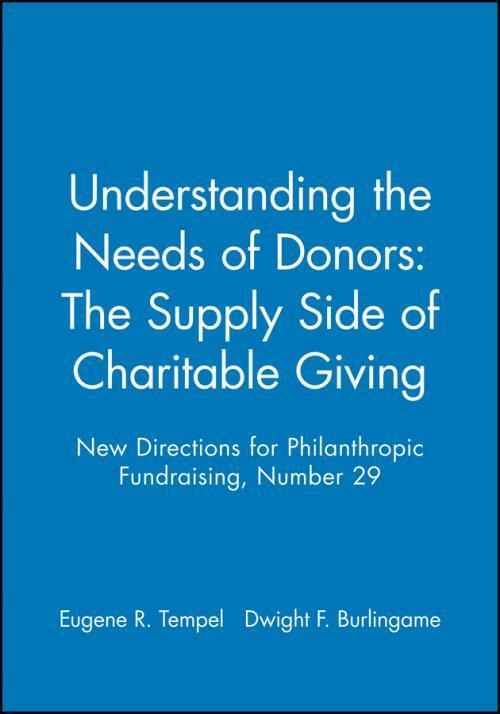 Proposes a meaningful–action paradigm to better understand why donors give, providing a useful guide for fundraising practice and research. Concludes with a challenge to donors to move from a "checkbook philanthropy" to a "citizenship philanthropy." This is the 29th issue of the Jossey–Bass series New Directions for Philanthropic Fundraising. Editors′ Notes (Eugene R. Tempel, Dwight F. Burlingame). 1. The material horizons of philanthropy: New directions for money and motives (Paul G. Schervish). 2. The spiritual horizons of philanthropy: New directions for money and motives (Paul G. Schervish). 3. Financial and psychological determinants of donors′ capacity to give (Thomas B. Murphy). 4. One more time: How do you motivate donors? (Donald N. Ritzenhein). 5. The new rules for engaging donors of color: Giving in the twenty–first century (Emmett D. Carson). 6. The public and private persona of philanthropy: The donor challenge (H. Peter Karoff).